In this guide to internationalisation, you’ll learn all about how to optimise websites that are multilingual and multiregional, to ensure that sites are indexed and served to the correct audiences in the correct languages. When websites go global and have many different language variations, international SEO is crucial for making sure that the right language versions of a website’s content are being shown in the relevant SERPs. For example, a person using Google in Spain is likely to want to use google.es, whereas a person in the UK will be more likely to use google.co.uk. Another consideration for international SEO is that sites using multiple languages and locations to serve similar content can cause duplication issues. If this duplication is not handled correctly, it can lead to indexing problems, as you may end up with one version of a page being indexed for a single market, and the content written for another market may be seen as duplicate and, therefore, ignored. For example, if you have a page targeting the UK that is a duplicate of a page targeting the US, then only the US page may be indexed. If internationalisation is handled correctly though, and the US version were to rank well for a user in the UK, the US result would simply be swapped out in the SERP for the UK equivalent. You’ll also see instances where multiple countries fall into a single market, such as a business with German content targeting users in Switzerland and Austria, as well as Germany. The issue here is that you would want the correct version of each website to show in their respective international search results so that users in each country would be able to see the correct currency, billing, and delivery information. There are four main URL strategies for hosting different international versions of a website. Each has its own advantages and disadvantages, which we’ll go on to explain in this section of the guide. A subdomain sits on a root domain, and is a part of this larger domain. Subdomains can be used to separate out different content versions, as Google sees them as separate entities. Can be configured using Google Search Console which allows you to easily control and manage geotargeting for Google. Can be configured using Bing Webmaster Tools which means that you can set and manage geotargeting for Bing. It is more convenient to set up geotargeting for specific subdomains as the subdomain and all of its subdirectories fall into the same geotarget. Allows the server to be physically hosted in multiple locations. This is a light signal used to determine the geotarget of a site, however, this signal is not as important now as it once was. Users may not recognise the location targeted from the subdomain alone. They may question if the site is US based (e.g. ending with .com) but targeting German speakers. Not all link equity necessarily flows from the subdomain to the root domain. A subdirectory is a folder that sits under a root domain. These aren’t seen as separate entities and inherit signals from the rest of the main site. Easy to implement as these are simply additional folders on the main site. Can be configured using Google Search Console which allows you to easily control and manage geotargeting for subdirectories separately in Google. Can be configured using Bing Webmaster Tools which means that you can set and manage geotargeting for subdirectories separately in Bing. Lower maintenance as these run under a single host. Link equity typically has a higher effect when all websites are located on the same domain. Users may not notice the geotargeting difference as it can become visually buried within the URL. This is likely to be the case on smartphones, as mobile browsers do not display the full URL. Users may also not notice the targeting in the URL if they land on the wrong geo-directory. A country code top-level domain (ccTLD) shows search engines and users which country a website is registered to and is an extension found after the domain name. ccTLDs are seen as separate domains and target regions and countries but not languages. ccTLDs are clearly apparent to users of the target market. This is important because in some markets a local domain is essential for gaining user trust. Server location becomes irrelevant as the ccTLD makes the targeted location clear to search engines. Geotargeting within Google Search Console is not possible for ccTLDs, as this is automatically assigned in most cases. However, some ccTLDs are considered international and can be targeted, such as .cc or .co. ccTLDs are more expensive to run and require more infrastructure as you need to host them all separately. Consistent domains may not be available in all markets for each ccTLD you want. You still need to maintain a URL strategy for language-specific content within a country, as geotargeting can’t be applied via Google Search Console, for example. There are often strict ccTLD requirements, such as being a registered company in several countries in order to buy their ccTLD. Some ccTLDs are not recognized as country-specific, such as .eu, .com, .asia and .org. URL parameters can be used to separate out language variations, and this can be done with a string at the end of a URL. These aren’t seen as separate entities. Using parameters helps to consolidate link equity because you aren’t separating out language versions into separate entities with their own link profiles. Geotargeting within Google Search Console and Bing Webmaster Tools is not possible. Parameters are prone to breaking and are often accidentally removed during redirection and paid promotion. Users may not notice the geotargeting difference as the parameter can become buried in the URL. There are a few different considerations to make when deciding which international web structure would best suit your business, such as domain authority and the types of structures your competitors are using. 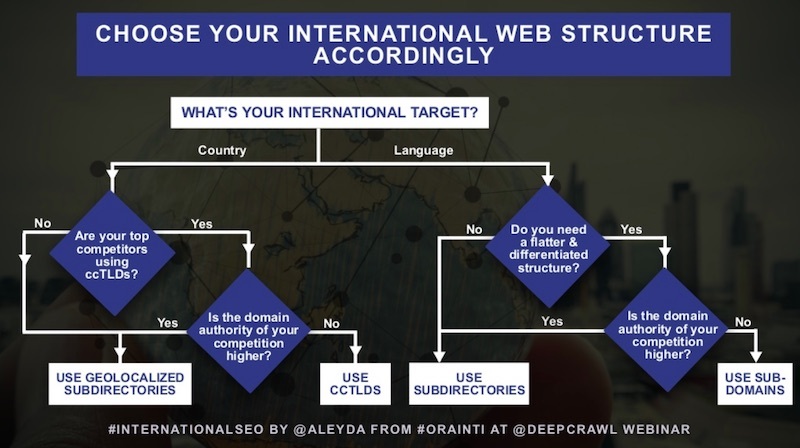 International SEO expert, Aleyda Solis, has created the flowchart below to help make your decision easier. Make sure you take a look at the internationalisation webinar we held with Aleyda if you want to learn more. In Google Search Console, geotargeting can be set up for country-specific subdomains with gTLDs (global top-level domains), and subdirectories with gTLDs. URL parameters are not possible to geotarget with. It is possible for sites to use the IP address of a visitor to determine their location and redirect them to the specific subdirectory or subdomain to best suit them. However, this is strongly discouraged because always redirecting based on IP will redirect crawlers to where they are based. Googlebot mainly crawls from the US, so if you set up an automatic redirect based on IP, then Google will only ever be able to find and index your US content. 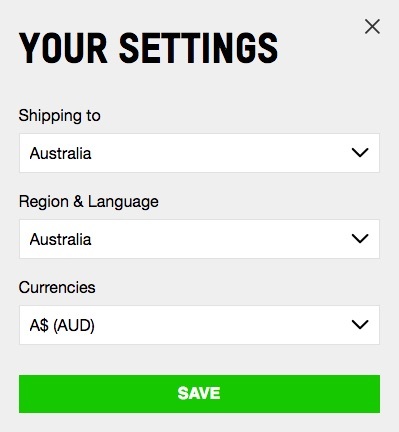 If it is being redirected away from content for other markets, it won’t even know your other language variations exist. This is why geo redirecting in general is poor practice and should generally not be implemented. If you identify Google under a USA IP address you should treat it the same as USA visitors, making other language options available to be explored. Google doesn’t only crawl from the US, and is now crawling more sites from other country IP addresses. However, other search engines still crawl primarily from the countries in which they are based. Bing crawls from the US, Baidu crawls from China and Yandex crawls from Russia, so this is yet another reason to be mindful of geographic redirection. Don’t rely on cookies to tell if search engines have been redirected, as they are not able to save cookies. Geographic redirection also causes problems for users because IP lookups and matching can be poor in some instances and can leave them stranded on incorrect sites. Further problems can arise where sites do not let users ‘leave’ the language section of the site that has been chosen for them. Any geo-redirection should be able to be overridden by the user. Some websites have pages where the content adapts based on the perceived location or language of the visitor, which are called locale-adaptive pages. This method is used when having separate URLs for different language variations is not possible for a website. Geo-distributed crawling: Where Googlebot would start to use IP addresses that appear to be coming from outside the USA, in addition to the current IP addresses that appear to be from the USA that Googlebot currently uses by default. Language-dependent crawling: Where Googlebot would start to crawl with an Accept-Language HTTP header in the request. This is for instances where sites using local-adaptive content are setting the Accept-Language HTTP request in the request header. Bear in mind that other search engines, social networks and crawlers may not behave in this way, so solely relying on this is poor practice.